I am excited to finally unveil this project publicly. I started acquiring samples of counterfeits more than two years ago and first posted some comparisons way back in April 2013. Those simple infographics got quite a bit of attention and some of them were even published in the June 2015 edition of Lost Treasure Magazine. In the 2+ years since those early posts I have seen numerous new fakes emerge, have seen significant improvements in the quality of fakes, have acquired dozens of additional counterfeit samples (some coming from helpful Realcent and Bullionstacker members, thanks guys! ), have seen the number of fakes on eBay escalate to disturbing levels, ran a gigantic group buy for Precious Metal Verifiers, and have even spotted a few fakes in the Buy/Sell/Trade threads that slipped past experienced stackers on these forums . It became more and more apparent that the coin and bullion community needs a central resource for cataloging and identifying this stuff. For over a year now I have been working in my "spare time" (ha!) to bring that resource to market. 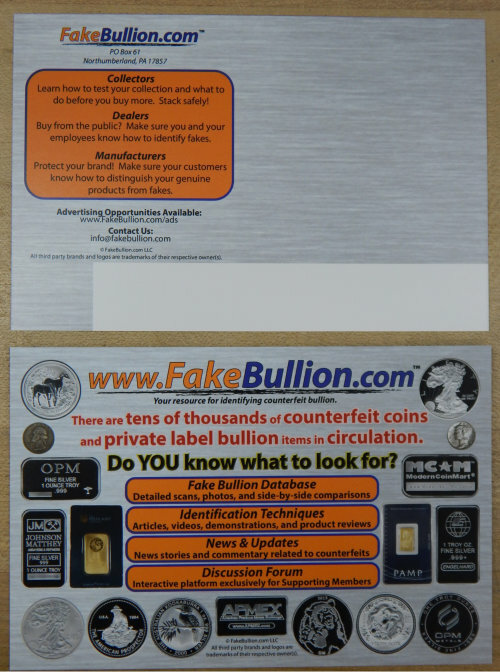 FakeBullion.com is home to the Fake Bullion Database, a central catalog of known counterfeits featuring side-by-side comparisons, detailed photos, and more in-depth discussion than what my old infographics provided. The Identification section features how-to articles (and videos will come later) explaining various testing methods and tools. There is a News section for relevant media stories and a Blog for commentary. There is also a Forum for Supporting Members. Acquiring samples, generating content, and building and hosting the website doesn't come cheap. As a thank-you to those who wish to contribute to the project, Supporting Members get to see new entries in the Database 60 days before the general public, and get access to the Forum. I will still be active on Realcent and BullionStacker, but going forward my efforts in regards to counterfeits will primarily be focused on the FakeBullion.com site. Right now there is a limited amount of content...about a dozen items in the Database and three identification articles. I have close to 100 unique fakes on hand and other testing techniques to discuss, so I will be adding new content weekly. I also plan to make videos to supplement the written articles. But it's time to launch the site and start getting the information out there (and start recouping expenses!). Before somebody says it, because I know it will come up... Doesn't this site also help the bad guys? In short, sure, it might. However, the counterfeiters have already made revisions and improvements to the fakes, long before this site. To name just a few, the 1 oz Engelhard bars, ASEs of numerous different years, and Pamp and Perth bars in several sizes (2.5g, 5g, 10g, 20g, 1 oz) exist in 2-3 generations, each one improving details over the last. The manufacturers get feedback from their customers (the scammers buying them in bulk), they don't rely on surfing the web to improve their "craft." Secondly, I do have two measures in place to block as much traffic from China as possible. Of course there are always ways to get around that. More importantly, the benefits of getting this information out to dealers and stackers far outweighs the theoretical risk. We can't stick our heads in the sand and pretend fakes don't exist, or try to hide them out of fear of scaring off potential buyers. They exist, hundreds of thousands of them, and they are becoming more common and more problematic. No government organization can fix the problem, even if they wanted to. 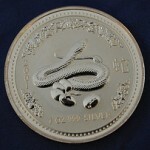 It's up to the coin and bullion community and industry to protect itself. Doing your own due diligence is more important now than ever, and FakeBullion.com will be a great resource for that process. Last edited by natsb88 on Mon Jan 23, 2017, edited 2 times in total. Nate, we are lucky to have someone like you who is dedicated to getting this information out there. Kudos! I'm of the opinion that full disclosure levels the playing field and is worth doing despite potential drawbacks. I also like how easy the site is to navigate and understand. Thank you, Nate for all your efforts in this area. I'm sure I speak for all of us when I say we appreciate what you've done and continue to do. I plan to refer everyone I can to your site and wish you much success. I assume info on becoming a supporting member can be found on the site? Many thanks for an excellent idea, project and job! This has been badly needed by the PM community for some time. thepmetalstacker wrote: Thank you, Nate for all your efforts in this area. I'm sure I speak for all of us when I say we appreciate what you've done and continue to do. I plan to refer everyone I can to your site and wish you much success. I assume info on becoming a supporting member can be found on the site? Great job Nate!! For people as myself, who are new to the stacking/collecting world, this is info that would take years for me to grasp. Now new stackers and I have a one stop site to investigate before making a purchase. Great job and thanks for spending the time to put this info out there. Thanks for all of your hard work, much appreciated! Awesome work Nate! I'm proud to be one of your first lifetime members. MaxGravy wrote: Awesome work Nate! I'm proud to be one of your first lifetime members. Just clicked around the site a bit and bookmarked it. This is an amazing resource, easy to use, and I see the great potential. Thank you for putting this together for the benefit of the community vs. the fakers. Will have to look into supporting when I've got the next paycheck. Thank you very much for this undertaking! We are all better off already, as a result! This week is very hectic for me (a number of meetings and appointments and I'm in a wedding this weekend so I'll be out of town for a few days for that) so there won't be much new on the site this week, but I expect to add a bunch of new items next week. Nate - Do you have a template that I could print on card stock and hand out to some of my LCS's and antique / gold buying places? In the future I may want to buy / sell at some of these places and it would be better to have them aware. Knowledge is power. wjruth wrote: Nate - Do you have a template that I could print on card stock and hand out to some of my LCS's and antique / gold buying places? FakeBullion.com now has Twitter and Facebook pages, and I am donating $1 to WFTW for every new follower added from last week until this Sunday 8/23. Up to 11 so far. Recently added Silvertowne and MCM silver bars to the database. Will be mailing postcards out to mints, coin dealers, "we buy gold" type places, pawn shops, etc. in the coming weeks. If you want to make sure your LCS gets one, PM me their address.